Levie van de Rhoer was born at Staphorst (just like his brother Joël) on 23 September 1877. He was married to Bilha Goldsteen, who was born in Meppel on 25 October 1878. They lived at 84 Emmastraat between 1931 and 1932. They were very nice people. Mrs. Luichies, a neighbor, still remembers that one day Mrs. Van de Rhoer asked her whether she should call her Mrs. Luichies or call her by her Christian name. The answer was: ‘Just call me Zwaantje’. Behind their house they kept some chickens for the soup on Fridays. At the front of the house they had a connection to the gas mains and (later) at the back a socket. One can still see the gas connection on the façade, which they used to illuminate the hut they built in their garden for the Feast of Tabernacles or Sukkoth. This is a feast of Thanksgiving for a good crop and also commemorates the temporary shelters used by the Jews during their wandering in the wilderness. They camped in this hut made of branches and leaves for a week. At the end of the feast they all marched to the synagogue, waving their palms and singing psalms. Later they moved to 58 Woldstraat. They had two sons, Samuel and Johan. Johan was married to Sara Sanders, also from Meppel. He was a teacher at the Rijks HBS (state grammar school) in Groningen, where he lived. They had no children. Samuel (born in 1909) was married to a Jewish refugee girl, who had fled from Germany before the war, Elisabeth Böttigheimer, born at Bamberg in 1914. The couple lived in the home of his parents. They had their first child on September 1942: Levie Leopold. Samuel was in a work camp then; he may have been home on leave for this occasion. The baby died twenty days after its birth, on 2 October. 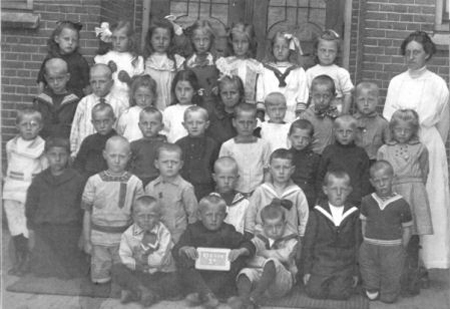 In 1915 Samuel van de Rhoer (sitting in front, to the right) was in the 1st form of Vledder School. 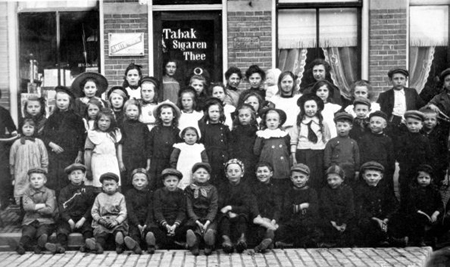 Samuel van de Rhoer (sitting on the sidewalk, 3rd from the left), Eduard van de Rhoer (sitting, 5th from the right) and Jaques van de Rhoer (standing, 1st row, 3rd from the right next to a girl). Johan (born in 1913) was married to Sara Sanders, a daughter of Photographer Izak Sanders. They both died in Sobibor on 23 July 1943. They had left Meppel before the beginning of the war. Levie van de Rhoer was a distinguished cattle trader. He used to visit his clients in a carriage. One Sunday afternoon, when he walked through Ruinerwold, he asked a Reformed farmer whom he knew whether he could see his animals. He could see them all right but of course he could not buy them on a Sunday. Once in the stables Levie suddenly asked: ‘What price will you ask for this cow tomorrow?’ The bewildered farmer mentioned the price and Levie said: ‘Then this cow has been sold for tomorrow.’ The next day the cow was fetched and paid for. It was not cheap, but the purchase was good for a laugh. The farmers sometimes repaid him with their jokes. Levie, who very firmly slapped hands after a purchase, was once asked to slap a nearby stone post instead of the farmer’s hand. Butcher Levie van de Rhoer. 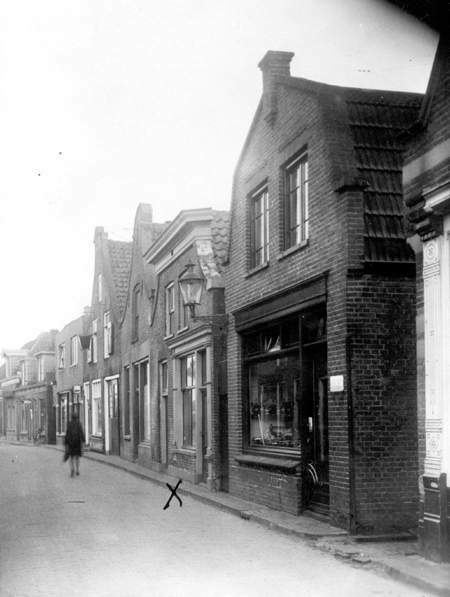 Together with his son Samuel, Levie also ran a butcher’s shop at 58 Woldstraat. This was formerly run by the Frank brothers. This Jewish business fell also victim to the anti- Jewish measures during the war. Early 1942, doing business was made impossible, as they could no longer buy meat. It was also forbidden to be a member of the Association of Butchers. This was officially confirmed when on 22 July 1942 Bilha went to the Chamber of Commerce to report that their business had gone into liquidation. Mrs. Van de Rhoer had to do this unpleasant job, because her husband was already at work camp Orvelte. 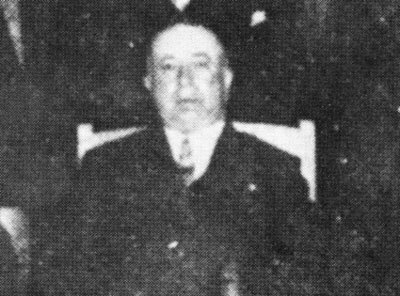 On 18 February 1943 Mr. Becker, who settled the matter for Omnia, reported the business had definitely been liquidated. Mid August Samuel left for the work camp at Linde. The ladies went to Westerbork on 3 October, where they probably saw their husbands back. None of them would ever come back to Meppel. Bilha, Levie, Elisabeth and Samuel were to stay in camp Westerbork for quite some time before they were killed in Auschwitz. Bilha and Levie died there on 28 August 1943, Elisabeth on 3 September 1943 and Samuel on 31 March 1944. After the Van de Rhoer family had been fetched from their house in Woldstraat, the shop was let to fishmonger Mansveld. The upstairs flat remained empty at first. As there was a great housing shortage in Meppel in those days, the flat was let. The new inhabitants asked Mr. Mansveld if they could put some stuff in the cellar, and to their great surprise they found furniture, paintings and jewellery there. They notified Mr. Mansveld, who promised them he would see to it that the goods were removed. This was done, but we do not know where it all went to.